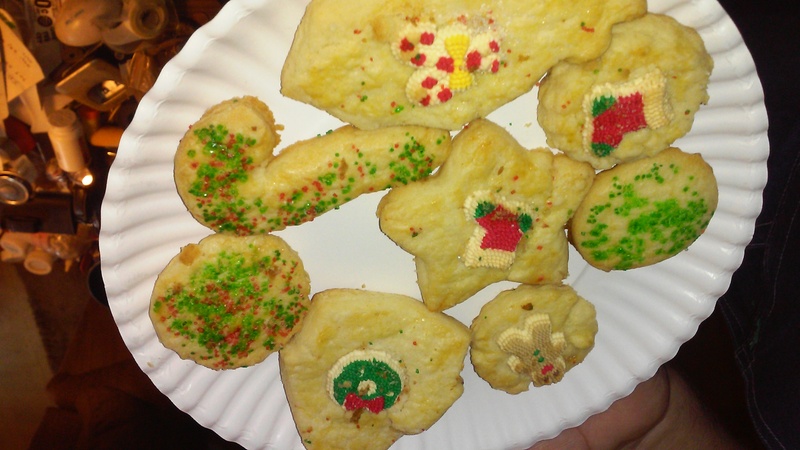 I remember making sugar cookies when I was a kid around Christmas. We used to give them out as presents to people that we cared about but couldn’t afford to buy gifts for. I had a great uncle who said our Christmas cookies reminded him of the tea cakes his mother made when he was a boy, and he looked forward to us making and gifting them every year. To be honest, I’d love to give everyone I know a little something for Christmas, but the old wallet just won’t let me do it. So this year I decided to bring back the old tradition of giving Christmas cookies with intentions of giving them to all the adults on my Christmas list. I didn’t realize just how many adults there are on my Christmas list. There was a little more heart than time involved with that one. I had to drop my ambitions a bit. And then as luck would have it, Mother Nature stepped in kicking a lot of my medical problems into overdrive and made it even harder to try to get them done. Over the weekend my mother, sister-in-law, and youngest son had the kitchen in Fatopia smelling so good I was about ready to gnaw my arm off. Oh my goodness, if only we had smell-o-vision so I could share what it was like in here on Saturday, you’d be ready to gnaw yours off too. I didn’t get to help at all this year, but instead of feeling bad about it, I’ve decided to look on the bright side. I have my health, family that cares enough to make my Christmas wishes come true, and Christmas cookies to munch on when I feel like it (because there still aren’t enough to give away), so I’m very blessed. See what I mean? And here’s the recipe so you can make your very own. Feel free to use any kind of sprinkles, colored sugars, icings, or anything else that tickles your fancy to decorate them, or just leave them plain. The great uncle I mentioned above liked them plain because that’s how his mother made them for him when he was a boy. Make up a batch and enjoy! And Merry Christmas! Preheat over to 350 degrees F. In a large mixing bowl, beat shortening and granulated sugar on medium speed until creamy. Add egg; beat until combined. Add flour**; mix on low speed until combined. Immediately roll dough into a log shape and slice into 1/4-inch slices. (For cutout cookies, foll out cough to 1/4-inch thickness and using cookie cutters cut into desired shapes). Sprinkle with additional granulated sugar if desired. Place cookies on ungreased baking sheets. Bake cookies 11-12 minutes or until edges are lightly browned. Be careful not to over bake. Cool on wire rack. Decorate with frosting or icing as desired. Makes about 36 cookies. Cook’s Tip: For firmer dough wrap tightly in plastic wrap and refrigerate for 30 minutes. We never have any of this stuff readily available at home, so we just go with self-rising flour and it works out just fine. We’ve always made them with it. **This is where you would add in all of the dry ingredients if you were using the all purpose flour, salt, baking powder, and cream or tartar. NaNa FatChick tip: If you cook them too long and they get a little hard, put a slice of apple on a paper towel in the container with the cookies, and it will soften them right up given a little time. Putting the apple slice on a paper towel is very important because if you don’t, the moisture will melt the sugar on top of the cookies.